A scene from "The Journey of the Skeletons" at UC San Diego. If you ever wondered about all those eerily smiling skeletal faces and sugar skulls in Mexican-themed gift shops, “The Journey of the Skeletons” will tell you everything you ever wanted to know… multiple times, in multiple ways… about Aztec history and the Mexican and Mexican-American celebration of El Dia de los Muertos, the Day of the Dead. This might be a better show for the fall season, closer to the November 2 annual date of the holiday, but this was a last-minute substitution, after “artistic differences and contract issues” jettisoned the originally-scheduled inaugural production of the fifth resident theater company at the La Jolla Playhouse, Teatro Máscara Mágica, or TMM. 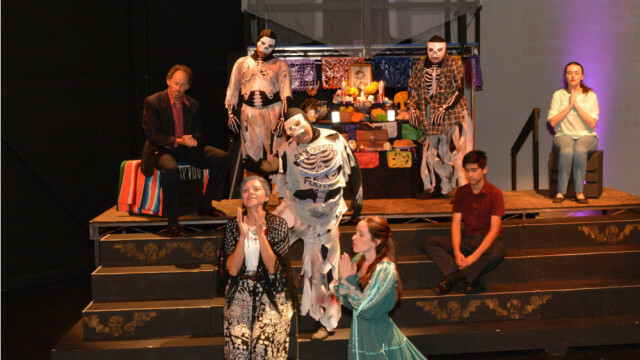 The group proudly announced the presentation of the oratorical play, “Missa Azteca: A Prophetic Journey,” a dream project of Bill Virchis, artistic director of TMM. When that project fell apart, Virchis and company (he maintained 90% of the original artistic and design team) had three weeks to cobble together something new, making use of the sets and costumes already in place. What they chose was a show about another journey, written by San Diegan Max Branscomb, professor of journalism at Southwestern College, who’s penned the group’s annual Pastorela scripts for most of its 25 years of existence. And although this new play isn’t written in rhyme, like the annual Christmas show, it bears many of the same elements: mixing comedy (and slapstick) with drama, topical references with cultural history and a journey that gets thwarted but ultimately completed. In learning about the Day of the Dead, we meet a family getting ready for the Big Night by creating an ofrenda (altar) for the departed, with all his favorite foods and pastimes represented, to welcome him when he travels back through the Underworld for one night. In the case of the Grandfather who died five years ago, it’s Spam, mole, baseball cards and fishing gear. The grandmother (Elisa Gonzales) and her daughter (Mariel Higuera) are the most traditional, retaining the ancestral customs and using a good deal of Spanish language. The grandmother’s son-in-law (Ken Raphael Gándola) is more assimilated, and his teenage children (Natalee Nordfelt; John Lopez), even more so, especially the skeptical son. They’re much more interested in the American celebration of the season; they even call Dia de los Muertos “Halloween with Spanish subtitles.” Why they’ve gotten to this age, and still don’t know about the annual family rituals is anyone’s guess (insert first big suspension of disbelief here). This makes for some awkward, and often didactic exposition. Along with the kids, we learn about the Aztec belief in the cyclical nature of life and death. Death is seen as a continuation of life, just on another plane of existence. “We make fun of Death,” grandmother explains once again, in case we didn’t get it, “to show we are not afraid.” She isn’t afraid of Death, she reiterates; she’s afraid her own family will forget her, and won’t be there, as she is for her late husband, to greet her on her trip back every year. It’s through altars, candles, prayers and thoughts that the memories of the deceased are kept alive. The Aztec way is to laugh at Death, not to fear it. Soon, we meet the deceased grandfather, Memo (Bryant Hernandez), and two of his buddies – one black, one white. They’re angels (wings and all) in a heaven located just above the family living room (in a set created by award-winning scenic designer John Iacovelli, accompanied by excellent projections – ranging from Aztec symbology to heavenly clouds and hellish volcanoes. Going against tradition, and showing his multiculturalism, Memo invites his two buddies (one black, one white, amusingly played by Rhys Green and Timothy Paul Evans) to come along for the journey through the underworld to the land of the living. They become skeletons for their travels, and are thwarted at every turn by Mictlantecuhtli (excellent Joseph Molina), the evil Lord of the Underworld, the cruelest of the Aztec gods (AKA “the vato from Hell”; those sugar skulls represent him). And we can’t forget his growling, prowling underling, the bone-crunching Jaguar, Colmillos (very funny Macedonio Artega, Jr). As with the Pastorela journey of the shepherds to the Manger, the Good Guys are intercepted repeatedly (and in increasingly comical ways) by the Bad Guys, but all obstacles are ultimately overcome by clever thinking, and the trip is successfully made, resulting in satisfaction for the travelers and frustration for the evildoers. In this case, the onstage kids (Natalee Nordfelt and Ken Raphael Gándola) learn something about preserving their culture, and keeping alive the memory of those who’ve died. As directed by Virchis, the show is nicely done (especially in view of the minimal prep time), but there’s a bit too much yelling and bellowing. 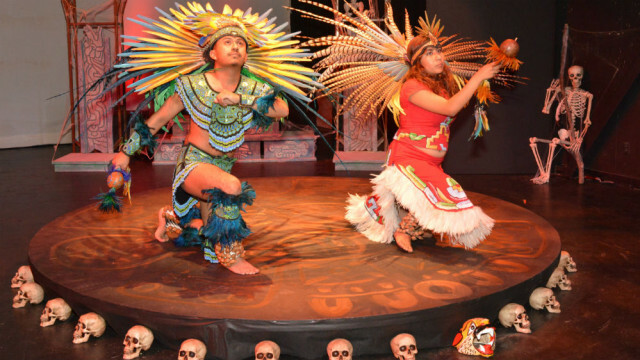 But the characters are well conveyed, the costumes are outstanding (the stunning Aztec dancers’ and Colmillo costumes are credited to Eva Sandoval). The live music, including wood flutes and something like a didgeridoo, added another layer to the proceedings. 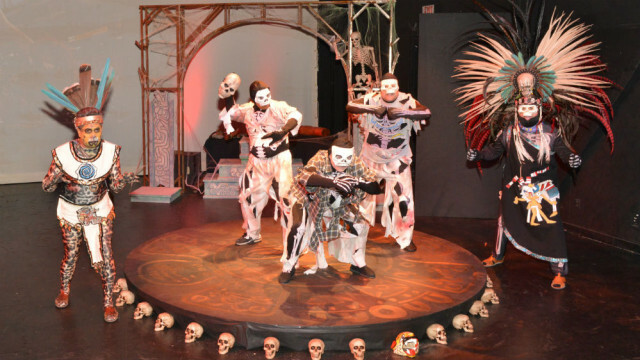 “The Journey of the Skeletons” runs through June 22, in the Shank Theatre, on the campus of UC San Diego. Performances are Wednesday-Saturday at 7:30 p.m., with matinees Saturday and Sunday at 2 .pm. Tickets ($10-$20) are at 800-838-3006 or online at www.brownpapertickets.com/event/616709.